Joy, David O. Russell’s partially fictional biopic of miracle mop inventor Joy Mangano, is a strange movie. It is dedicated to the strong women of the world, yet almost none of the women in the movie feel like fully realized characters. Beyond that, the majority of them are nasty pieces of work or just plain weird (constantly dressed in their Sunday best for no discernible reason), and they actively stand in-between the title character (played by Jennifer Lawrence) and her dreams of a world blessed by a self-wringing mop. There is narration throughout from a largely unseen character (Joy’s grandmother, played by Diane Ladd), and it feels instantly odd and lazy, a crutch as opposed to an asset. Certain character arcs go nowhere (at one point, Joy’s ex appears to have moved on with a new girl, but then it’s as if that never happened). The story basically begins with a flashback and ends with a flash forward, revealing just how much more happened in Joy Mangano’s life which the film is more or less completely skipping past. That’s somewhat understandable from a biopic, but the fact that we are told about and not shown something which would have been the more logical stopping point for the story feels unforgivable. The whole film feels like you can still see Russell, who also co-wrote the script, up there on the screen trying to figure out what his movie really is. It’s about a woman whose dream was deferred. 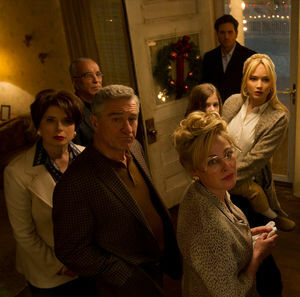 No, wait, it’s about a crazy American family (Robert De Niro’s the hot-tempered grandpa with a wealthy new girlfriend played by Isabella Rosellini, Virginia Madsen’s the practically catatonic grandma, Jennifer Lawrence’s the do-it-all matriarch, Elisabeth Rohm’s the unsupportive half-sister, Edgar Ramirez is the unemployed ex-husband living in the basement) struggling to get by without killing each other. No, wait, it’s about the rise of home shopping networks on television, which is where Bradley Cooper briefly comes in. No, wait, it’s about making friends and enemies in commerce, and learning how to tell the two apart. No, wait, it’s really about mothers and daughters, and the necessity for the mothers of the world to support their daughter’s dreams, no matter what. Of course, the real Joy Mangano now has an estimated net worth of $50 million. Dreams are clearly not for fools, at least not in her case. However, in that moment in the film she has no idea that future awaits her, and instead rails against her grandmother for filling her head with ideas about doing something big with her life. She concludes that maybe her mother had it right – just do enough to get by and escape from the world into soap operas. Yet that’s another area which feels only half-realized. The actual opening scene of the movie is a recreation of Joy’s mother’s favorite soap opera (pictured above), and it is a setting the film returns to on multiple occasions during dream sequences in which the adult version of Joy is berated by the idealistic child version of herself who is upset that her potential has gone unfulfilled. In each case, Joy’s entire family is there, stepping in for the soap opera characters, and you barely notice the difference because they all more or less seem like soap opera characters anyway. That might entirely be the point, pointing out that Joy was sort of living out a sad, blue collar life surrounded by outsized personalities who were more enemies than friends/family. Or it might be a point of differentiation between Joy and her mother, the one could not as easily escape into fantasy as the other. It could also be meant to establish that countless women like Joy’s mother were glued to their TVs, a captive audience just waiting to be sold something like the miracle mop through QVC, especially if one of the actresses from America’s most popular soap opera showed up on QVC to hawk a new dress line. You can kinda, sorta see how it all connects, but, rather distressingly, you’re never sure if the movie actually knows for sure how it all connects. Instead, you suspect that Russell ignored problems with the script and assumed they would find the story during filming and post-production but failed to pull that off. As is, poor Virginia Madsen is stuck playing a soap opera-obsessed version of Miss Havisham from Great Expectations while everyone else is off in a very different kind of story. Madsen is not alone, though. Very few of the actors in this movie are well-served by Russell’s direction and writing, not even Robert De Niro. Actually, the best part of Joy is Jennifer Lawrence. To be clear, she is too young to be playing this role. The real Joy was in her early 30s during the portion of her life depicted in the movie, and she had three kids, not two. 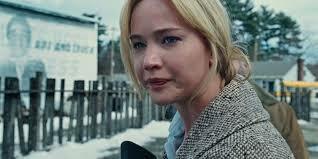 The movie version of Joy is not necessarily meant to be just like the real Joy Mangano, though. Her last name is never mentioned, the phrase “miracle mop” is never spoken aloud, her half-sister is completely made-up for the movie and the details of her life with her ex-husband are also mostly fictionalized. If you know nothing of the real Mangano, you can easily go along with the details of Lawrence’s version of her. However, you always know in the back of your mind that she’s simply too young to be playing a mother of two who has been beaten down by life to the point of near-submission. You need Julia Roberts-Erin Brockovich era for this role; not Julia Roberts-Pretty Woman/The Pelican Brief era. But every time Lawrence is on the screen you can’t look away. The most exhilarating scene in the film, Joy’s first time selling her mop on QVC, trades upon the Jennifer Lawrence specialty at this point: authenticity. The key to Joy’s success on QVC, the film argues, is the way she managed to come off as a genuine person with a passion for and working knowledge of the product she was selling as opposed to a media-trained saleswoman who knew to emphasize her hands because that’s what the audience is really looking at. That’s the quality the real Joy had, and it’s the quality which has characterized much of Lawrence’s career. Who else but her would admit on the Hunger Games/Joy promotional tour that she not only kissed one of her hot, male Hunger Games co-stars off-screen but that she was also possibly high when she tripped on the stairs on the way to accept her Oscar for Silver Linings Playbook. Joy stretches that quality to the breaking point. You never stop buying Lawrence’s Joy as a real person capable of recognizable emotions and faults. You root for her to succeed because who doesn’t like a good rags to millions of mops story. However, you know the entire time that while Lawrence is giving a genuine performance she has possibly been pushed too far by her trusted maestro, David O. Russell. Joy is the most flawed David O. Russell movie in quite a while, giving you the sense that he needed a re-write or two on the script and maybe another month in the editing bay to get it right. There’s only so much Jennifer Lawrence can do to help Russell clean up the mess, but watching her give it her best is frequently exhilarating. Great review, and I completely agree with everything you’ve written. What a disappointment. Thanks. I liked your review too, particularly the part about how Silver Linings Playbook has that one remarkably effective, emotional scene with De Niro giving a speech to Cooper and how there’s nothing remotely on that level in Joy. Thanks! I just connected a lot with SLP, and I found no emotional connection with Joy. I’m with you on that. I walked out of SLP literally calling friends and telling them they needed to see that movie. It just gave me such a jolt of energy and overwhelmed me with joy, and I’ve re-watched a couple of times since then when it was running non-stop on one of the cable channels. I’ll probably never re-watch Joy.